This is another childhood favorite of mine! Mango is my favorite fruit, but if you can't find any in your neck of the woods, you may substitute with peaches. 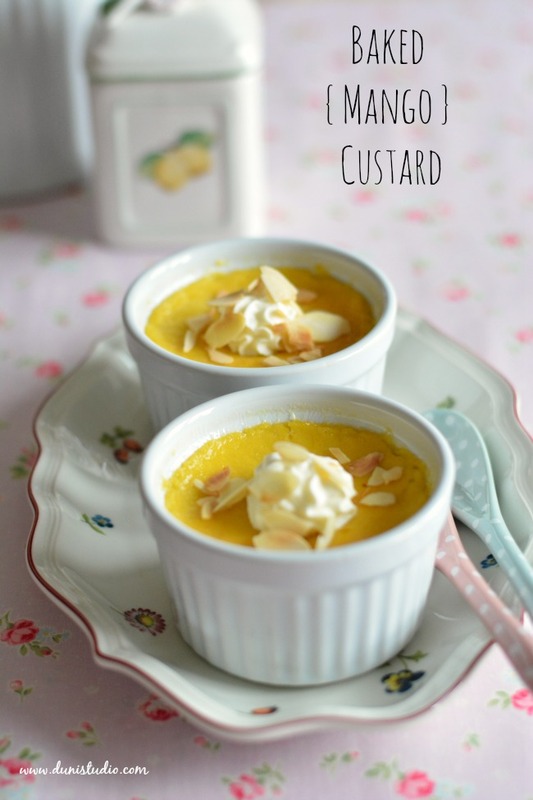 These custards are easily made. Just make sure to use super fresh eggs and double cream. 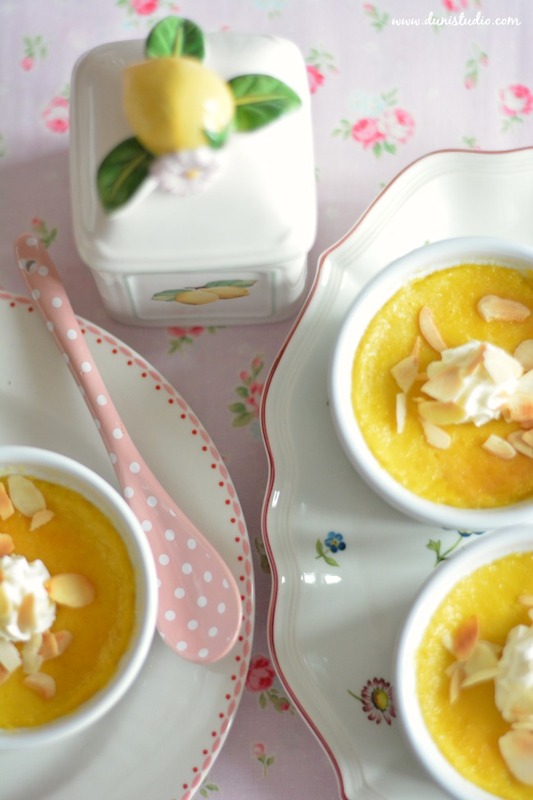 The individual custards are baked in an ovenproof dish or dishes filled with boiling water. 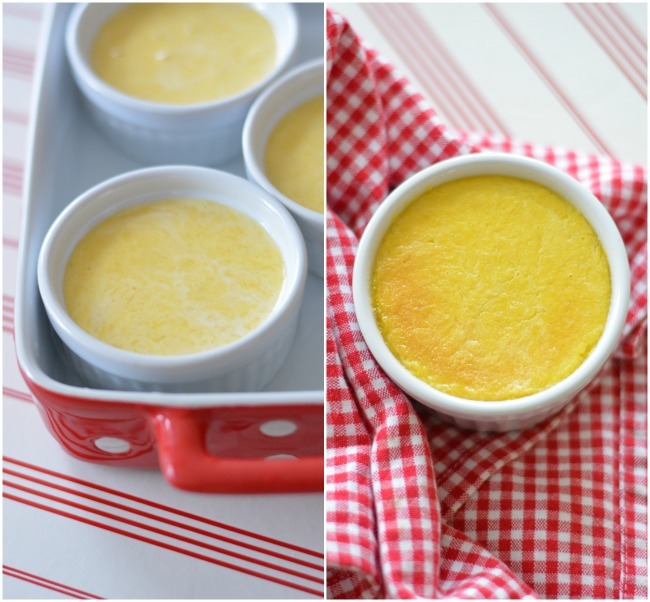 The baked custards should be set and golden on top (see picture below). This recipe makes 8. Wieder ein Lieblingsrezept aus meiner Kindheit! Mango ist meine liebste Frucht, aber wenn es die nicht zu kaufen gibt dann lässt sie sich mit Pfirsichen ersetzen. Diese Eiercreme ist schnell gemacht. Man sollte jedoch darauf achten, dass die Eier sehr frisch sind und Creme double verwenden. The einzelnen Portionen werden zum Backen in ein ofenfeste, mit kochendem Wasser gefüllte Form (oder Formen) gesetzt. Ergibt 8 Portionen. 1. preheat oven to 325°F. Peel the mangoes, cut away and chop the flesh. Add juice of half a lemon. Blend until smooth. 2. In a large bowl beat the egg yolks, sugar and ginger together until thick and pale. Stir in the mango purée. In a pot heat the double cream until gently simmering. Stir into the mango mixture and mix evenly. Pour mixture into eight ramekin dishes. 3. Place in ovenproof dish filled with boiling water to come two-thirds of the way up the sides of the ramekin dishes. 4. Bake for approx. 30 minutes, remove from oven and leave to cool slightly. Chill for a couple of hours. 5. 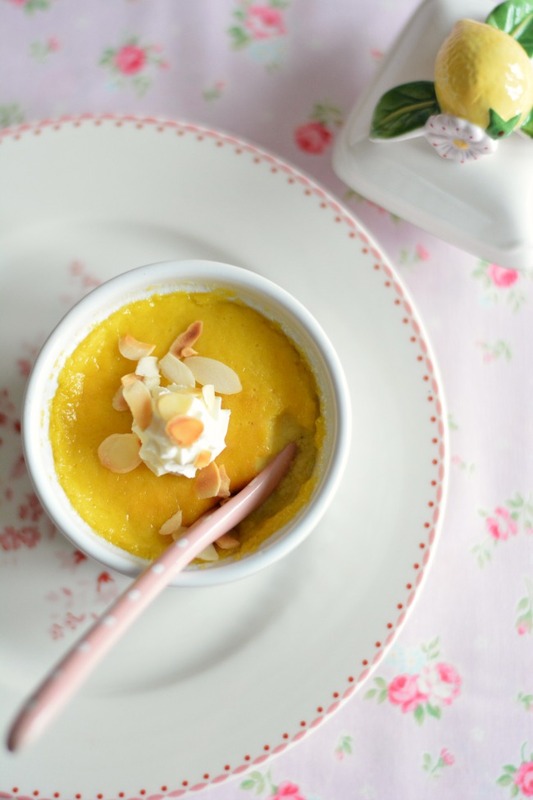 To serve - pipe a dollop of whipped cream on each one and sprinkle with toasted almonds. Serve immediately. 1. Ofen auf 160°C vorheizen. Mangos schälen, Fruchtfleisch in kleine Stücke schneiden. Saft einer halben Zitrone dazu und glatt pürieren. 2. In einer Schüssel die Eigelbe mit dem Zucker und Ingwerpulver cremig schlagen. Mangopüree unterrühren. In einem Topf die Creme double bis zum Siedepunkt aufkochen, zu der Mango-Eiercreme geben und gut umrühren bis alles vermengt ist. In acht Auflaufförmchen füllen. 3. Die Förmchen in die ofenfeste, mit kochendem Wasser gefüllte Form stellen. Das Wasser sollte gute zwei-drittel am Rand der kleinen Förmchen hochkommen. 4. Circa 30 Minuten backen bis die Eiercreme gestockt und goldgelb ist. Aus dem Ofen nehmen und ein wenig abkühlen lassen. Für mehrere Stunden in den Kühlschrank stellen. 5. Vor dem Servieren ein wenig geschlagene Sahne obendrauf geben und mit Mandelblättchen bestreuen. Guten Appetit! das sieht furchtbar lecker aus und scheint nicht allzu schwierig zu sein. Ich liebe Mango auch über alles. I wonder if this recipe would work with a flax egg and coconut cream? jetzt hast Du mir aber riesigen Appetit gemacht! Die Creme sieht so herrlich und lecker aus! Ich mag Mango auch sehr, und das werde ich sicher auch mal nachmachen! Danke für dieses schöne Rezept! I have never been too excited about custards (it's a texture thing). However I would probably love this since mangoes are also my favorite fruit! I will be printing this one to try. :) The color is amazing! Never had a dish like this, but I would love to try! Looks and sounds delicious. Wow, this look so yummy! I love the polka dots spoon! Thanks for sharing great recipe! Those look yummy! I just saw mangoes at the store the other day so maybe it's a sign I need to make these! We love mangoes at our house, too! We had some mango salsa at our birthday party, and sometimes we make mango and sticky rice for dessert. :-) These look delicious! :O that looks amazingly delicious. And your photos here are perfection, too. oh these remind me of my childhood .... my mom used to make them and I'd have one when I came home from school. I can smell them now in the oven! So ein Rezept habe ich noch nie gesehen, liebe Duni!